Caletensium et Bononiensium Ditionis Accurata Delinatio. 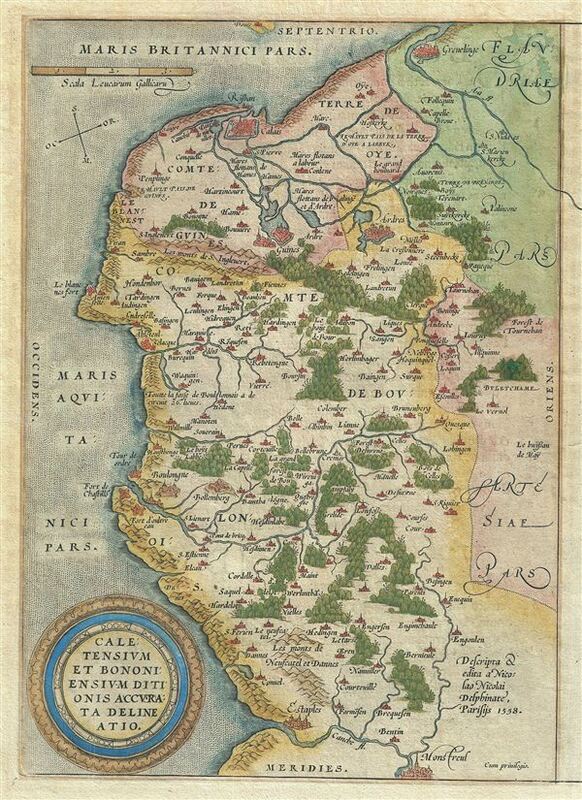 This is a rare 1579 Abraham Ortelius map of the French department of Pas-de-Calais. It covers the French and Belgian coastline from Estables to Calais. This area is known for producing Maroilles, a soft cheese made from cow's milk and with a washed rind. Cartographically based upon a four sheet map issued by Nicholas de Nicolay in 1558, it features a decorative title cartouche in the lower left quadrant. Shows the region in wonderful detail with attention to forests, cities, rivers, villages and other topographical features. Published in Antwerp by A. Ortelius in 1579 for issue in his seminal atlas Theatrum Orbis Terrarum. Very good. Minor overall toning. Text on verso. This map was originally part of a larger sheet on which several maps were printed, consequently the map's printing and plate mark extend off the right hand side of the page.